We flew from Rome (FCO) to Barcelona (BCN) using Vueling airlines. The plane was a smaller plane and since we couldn’t check in online, we were seated at the very back of the plane. I hated it! The seat couldn’t recline and the space was so small. We spent C$ 300 for 2 one-way ticket through Expedia. After surviving two hours flight, we finally arrived at Barcelona. We took Aerobus to go to our hotel (Ayre Gran Via), so we got off at Placa d’Espanya. One way ticket is € 5.90 and return ticket is €10.90 (valid up to 9 days after purchasing –ref). As soon as we exit the arrival gate, we followed the Aerobus sign that led us to a lower level bus station. Although we saw there was a huge line up, the service was actually prompt and fast. The great thing is that the bus leaves the airport every 5 minutes! We saw a vending machine nearby the platform but most people bought the ticket by paying the lady at the bus door (cash only). So maybe the vending machine is available for those who doesn’t have cash ready. We purposely booked Ayre Gran Via hotel since the Aerobus stops right in front of the hotel (the bus stop going back to the airport is located across the street – near Catalonia Barcelona Plaza hotel). There are many other stops along the city center too but some may require you to drag your luggage all the way to your hotel. Ayre Gran Via hotel was a pretty good hotel. The modern and bright decoration gave the impression of new hotel. 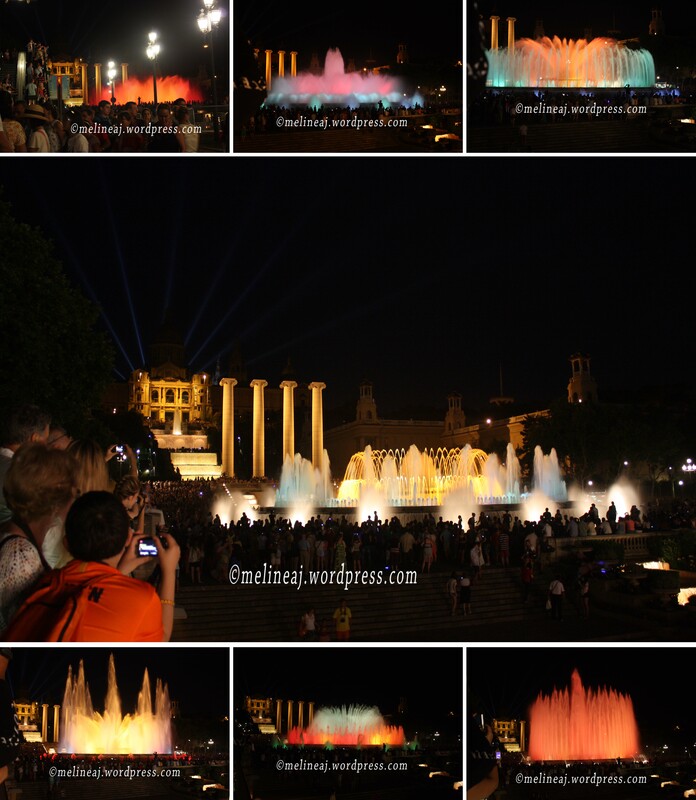 It was a block away from Placa d’Espanya metro which was very convenient. 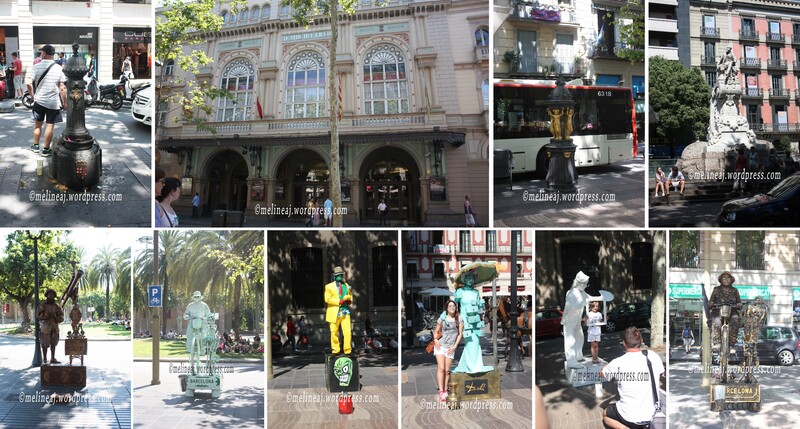 From Placa d’Espanya station, we got off at Liceu station to walk along the famous La Rambla street. The centre of the street is actually closed for pedestrians, while the single lanes at the right & left side of the streets are available for cars and buses. We walked along the centre street and there were lots of stalls along the stretch. We saw a gelato shop, a candy shop, a flower stall, a pet store (!) selling rabbit, guinea pig & love bird, and seed stalls selling ‘unique’ type of seeds (see the picture and you’ll know :P). In addition to the small stalls, there were lots of restaurant and tourist shops on the sides. On the right hand side (we walked from the city centre toward the port), we saw Mercat de Sant Josep de la Boqueria (or La Boqueria), the large public market in Barcelona. Since it was late afternoon, the market was closed, so we only took picture in front of it. We also passed by several attractions, such as Liceu Theatre, Erotica Museum with Marilyn Monroe impersonator waving to us from the balcony, and Wax Museum. At the end of La Rambla, there was an open space where lots of street artists set their spot. They dressed like a tin man, Galileo Galilei, an Italian painter, etc and tourists who gave them money were able to take picture with the performers. At the very end of La Rambla toward the port, there is a column dedicated to Christopher Colombus or known as Colom. 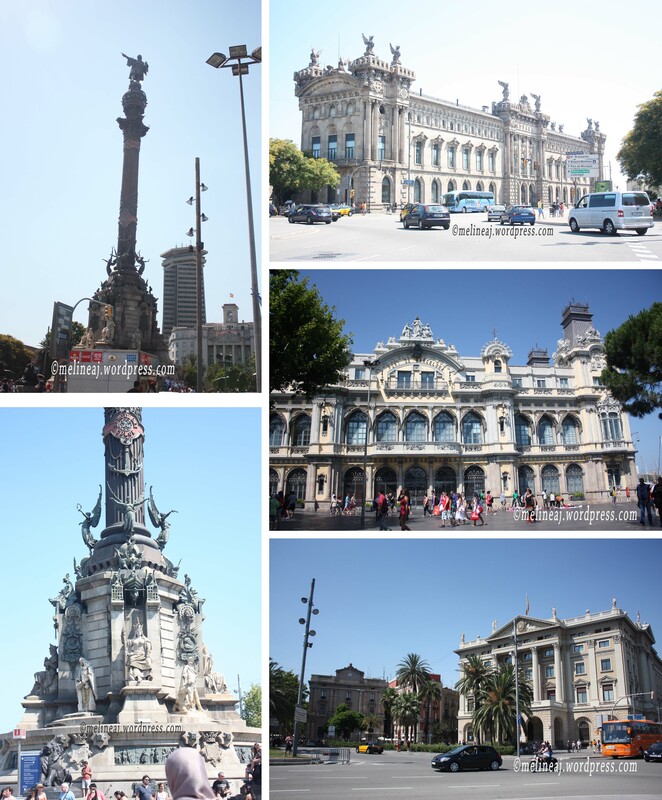 The top of the Colom is a bronze statue of Christopher Colombus pointing out toward the sea. The monument is at the centre of a roundabout connecting La Rambla, Passeig de Colom, and Passeig de Josep Carner. We walked straight crossing the monument toward the marina (Rambla del Mar) of Port Vell. It was super hot even when we were near the water! However, the view from there was pretty amazing. The sail boats parked neatly side by side on the marina on the blue water with clear blue sky… ah… simply stunning! There was a girl sitting on the steps and feeding the seagulls, so we sat nearby while enjoying the beautiful view. 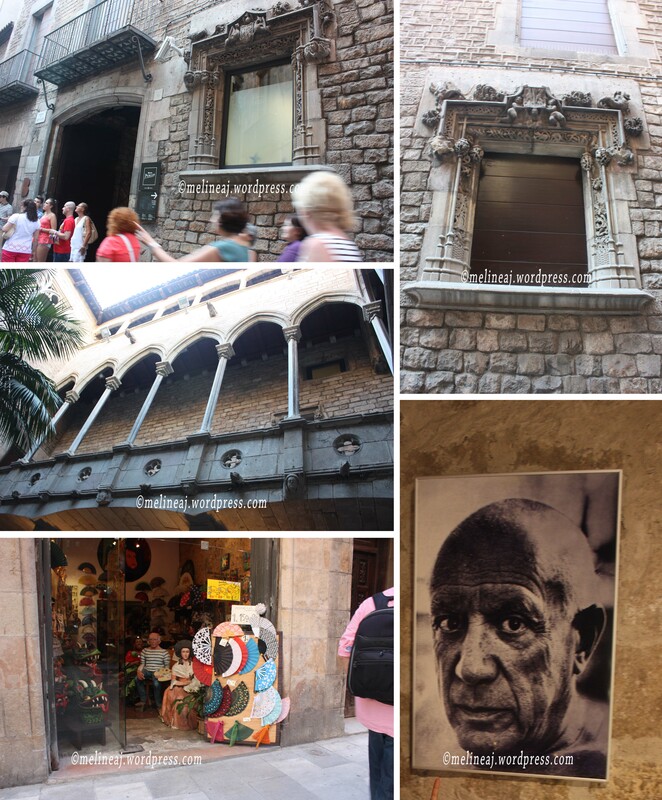 We walked back to La Rambla and we turned left at Carrer Nou de la Rambla to visit Palau Guell. We saw a lot of people was lining up to enter the house and it turned out that people could enter the house for FREE since it was the 1st Sunday of the month. However, the guard told us that they couldn’t admit more people because all the tickets were sold out 😦 So, we just took a bunch of pictures at the front of the house. I was a bit disappointed since I was super excited to explore all the Gaudi’s works. Yeah… my first encounter wasn’t really successful 😦 Anyway, I still admire Antoni Gaudi although I couldn’t see the inside of Palau Guell. The intricate wrought-iron work on the gate was super amazing! Gaudi had a clever yet subtle method to incorporate the initial of Eusebi Guell, the mansion owner, at the top of the 2 gates. Between the 2 gates, there is a beautiful iron shield with a dragon perching on top of a helm (ref). Since I could only took picture from the small street, I couldn’t really capture the whole mansion. However, I did capture the well-known colorful cones at the top of the roof 🙂 I LOVE LOVE LOVE Gaudi’s work! The colors and the intricate design are out-of-the world!!! He is truly one of the best architect in the world! So, yeah… He is one of my FAVOURITE artists! 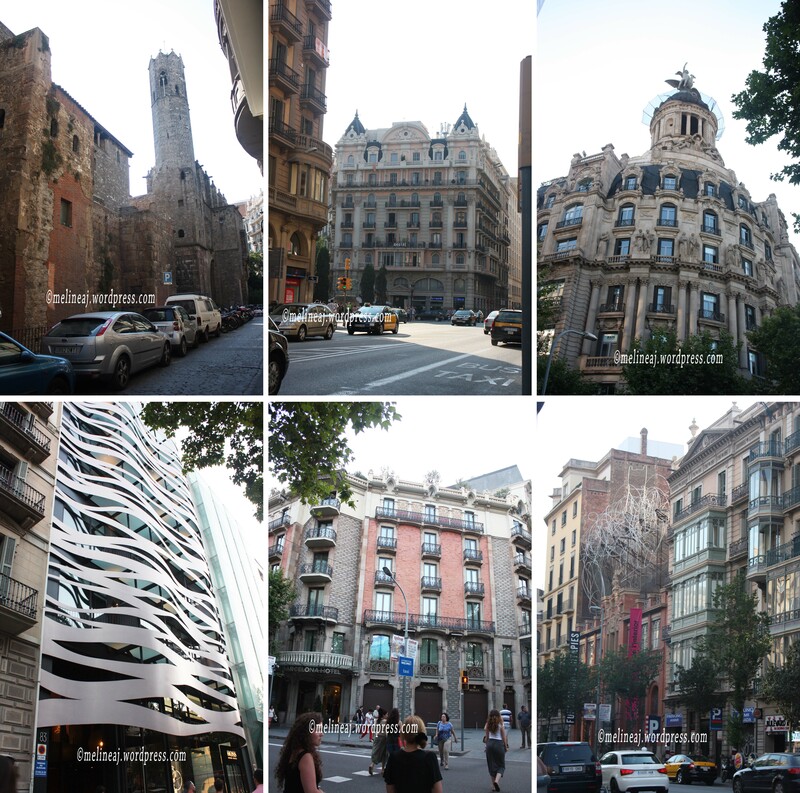 Our next destination was Barri Gotic, the old part of Barcelona. We walked along Carrer Ferrán and I saw a cute bakery shop La Cure Gourmande. Once we entered the shop, I fell in love with it! The vintage tins were everywhere! Super CUTE!!!! One of the server gave us sample of the raspberry galletas (biscuits) and it was super delicious!!! The biscuits were pretty expensive. I think one biscuit was € 3.50 and depending on the size of tins, it costs € 5-10/tin. However, if you buy 10 biscuits, you’ll get a tin for free. We bought 3 types of biscuits: lemon filling, raspberry filling, and almond but our favourite is the raspberry one! Along with the biscuits, this shops also sells nougats, chocolate, caramel, and lollipop. Since we hadn’t had lunch, we decided to have an evening meal (it was almost 4 pm!). 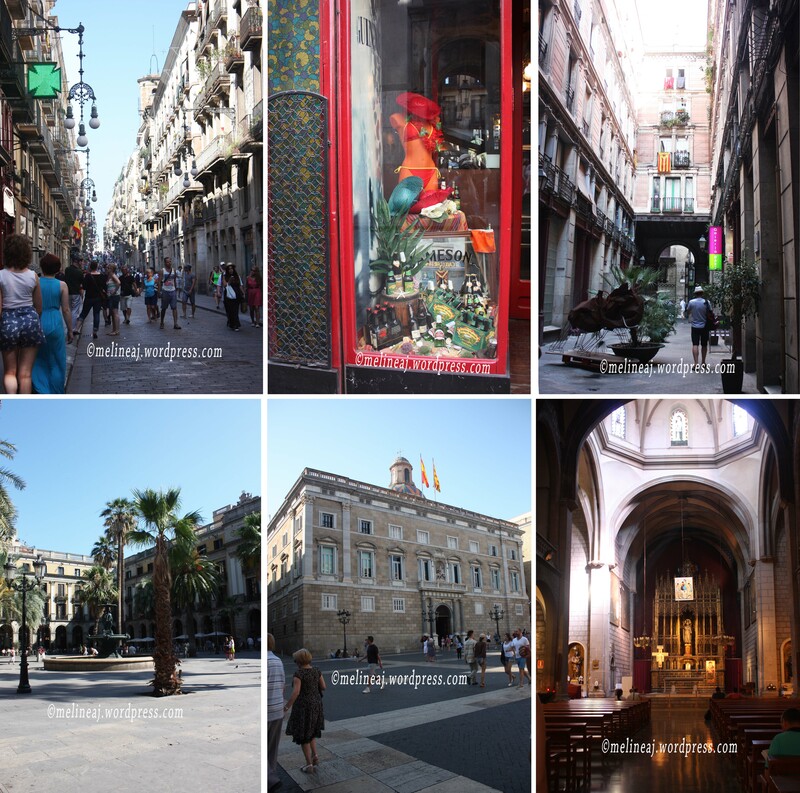 We walked in a small alley and it led us to Plaça Reial, a big plaza in the middle of Barri Gotic. There were lots of restaurant around but we only sat on a bench and ate our biscuits. The tall palm trees and the fountain at the centre of the plaza felt like an oasis in the middle of busy Barcelona streets. Le Cure Gourmande cookies were heavenly!!! Our next goal was exploring the houses designed by Gaudi. 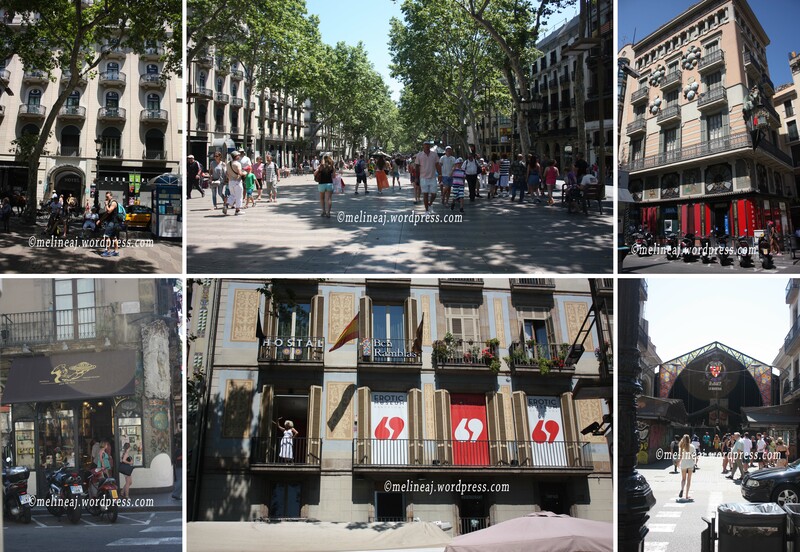 From Jaume station, we got off at Passeig de Garcia station and walked along Passeig de Garcia. This street is actually a shopping streets, so we took our time to check out some stuffs along the way. The modernist houses on Passeig de Garcia are called the Block of Discord. The houses were designed by the most important Modernista architects. It began at Casa Lléo Morera (No. 35) that was designed by Lluís Domènech i Montaner. This building sits at the corner of Passeig de Garcia & Carrer del Consell de Cent and Loewe is at the lower level of this building. 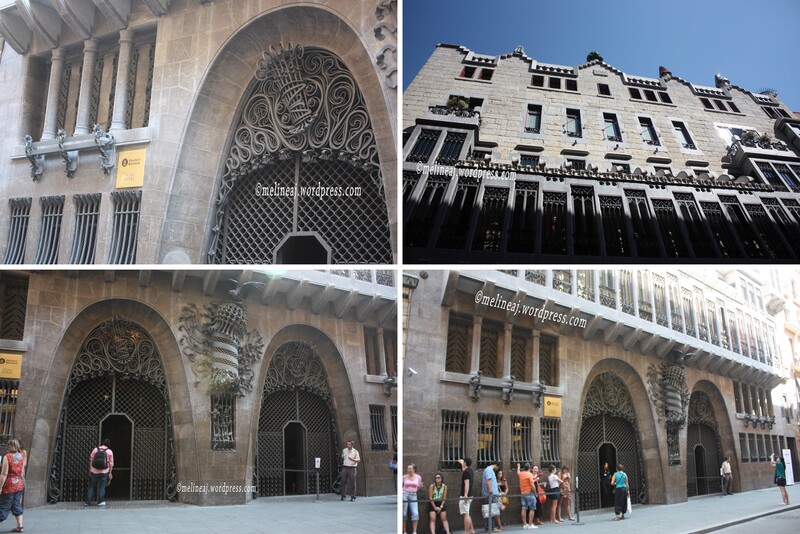 A few steps ahead, the 2 adjacent buildings are Casa Amatller (No. 41) designed by Josep Puig i Cadfaich and Gaudi’s Casa Batlló (No. 43). The colorful ceramic mosaic on the wall of Casa Batlló along with the unique mask-shaped balconies makes it noticeable from afar. Gaudi even designed the top of the building to look like the back of dragon with colorful ceramics stacked to mimic dragon’s scale. The columns on the 2nd floor looked like bones and that’s why locals call it Casa dels ossos (House of Bones). The ticket to enter Casa Batlló is € 20.35! Pretty expensive, right?! We only sat on a bench in front of the house to adore it. A couple block from Casa Batlló, La Pedrera (Casa Milà) stands elegantly at the corner of Passieg de Garcia & Carrer de Provença (No. 92). The large blocks of limestone with the soft curves makes it looked like a sculpture than a building. The iron work on the balcony rails looked intricate yet stunning! From the front, it may not look as spectacular as Palau Guell or Casa Batlló, but when we peeked inside the lobby from the beautiful glass gate, we knew that the inside was spectacular! Unfortunately, it was already closed, so we couldn’t go inside the house. 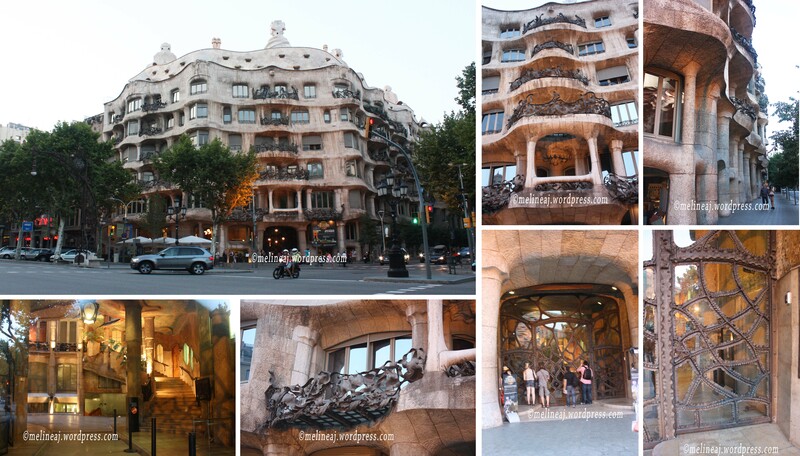 From the book about Gaudi, I read that the details inside this house are super amazing! The mosaic tiles, the chandelier, even the toilet was beautifully designed. If you do visit La Pedrera, don’t forget to go up to the roof. The undulating roof design with chimneys resembling masked men is a nice place to enjoy Barcelona view from above. Along Passeig de Garcia, there are more interesting buildings that have futuristic design, such as a building with undulating metallic on its window fascade and a building with tangled wires on its roof. As a contrast, there are also buildings with more classical designs. It seems that Barcelona embraces the clash of beautiful architectural designs; no matter if it’s modernist, classic, or futuristic.